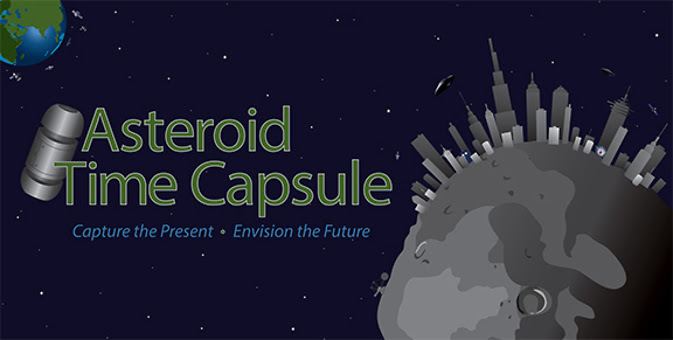 Washington, D.C. September 3, 2014 – NASA is inviting the worldwide public to submit short messages and images on social media that could be placed in a time capsule aboard a Lockheed Martin-built spacecraft launching to an asteroid in 2016. Called the Origins-Spectral Interpretation-Resource Identification-Security-Regolith Explorer (OSIRIS-REx), the spacecraft will rendezvous with the asteroid Bennu in 2019, collect a sample and return the cache in a capsule to Earth in 2023 for detailed study. The robotic mission will spend more than two years at the 1,760-foot (500-meter)-wide asteroid and return a minimum of 2 ounces (60 grams) of its surface material. Topics for submissions by the public should be about solar system exploration in 2014 and predictions for space exploration activities in 2023. The mission team will choose 50 tweets and 50 images to be placed in the capsule. Messages can be submitted September 2 – 30. This event is the second of NASA’s efforts to engage space enthusiasts around the world in the OSIRIS-REx mission, following the agency’s January invitation to participate in Messages to Bennu, which asked the public to submit their names to be etched on a microchip aboard the spacecraft. “It is exciting to think that some people may formulate predictions, then have the chance to help make their prediction a reality over the next decade,” said Jason Dworkin, OSIRIS-REx project scientist at NASA’s Goddard Space Flight Center in Greenbelt, Maryland. The OSIRIS-REx mission is focused on finding answers to basic questions about the composition of the very early solar system and the source of organic materials and water that made life possible on Earth. The mission also will contribute to NASA’s Asteroid Redirect Mission (ARM) and support the agency’s efforts to understand the population of potentially hazardous near-Earth objects and characterize those suitable for future asteroid exploration missions. NASA’s ARM is a first-ever mission to identify, capture and redirect a near-Earth asteroid to a stable orbit around the moon, where astronauts will explore it in the 2020s, and return with samples. The mission will advance the new technologies and spaceflight experience needed for humans to explore Mars in the 2030s. NASA’s Goddard Space Flight Center will provide overall mission management, systems engineering and safety and mission assurance. The University of Arizona, Tucson, is the principal investigator institution. Lockheed Martin Space Systems of Denver will build the spacecraft. OSIRIS-REx is the third mission in NASA’s New Frontiers Program. NASA’s Marshall Space Flight Center in Huntsville, Alabama, manages New Frontiers for NASA’s Science Mission Directorate in Washington.